Imagine catching a glimpse of this some night in a darkened room you thought was empty. Phil Roberts photo. My wife Sherry has a death wish — for me. Not really, but sometimes I do wonder. Here are some true stories to prove my point. To say I don’t like snakes is putting it mildly. Our boys, when they still lived at home, had a realistic looking, 3-foot long rubber snake they played with. But I think Sherry got as much enjoyment out of it as they did. Once I was walking through our garden and came upon the rubber snake at my feet, coiled among some plants. My heart nearly stopped. That was my wife’s handy work. Another time she had the snake hanging from a low branch in our maple tree in the back yard. Again, my heart went pitter-patter when I nearly walked into it, and she just laughed. I’m also not a fan of rodents or spiders, and I can’t tell you how many times I’ve found a rubber mouse or spider on some route that I’m known to walk. Then there was that shadow in the bedroom. In the early ‘80s, I came home and found that Sherry had already retired for the night. So I quietly slipped into our bedroom, which was lit only by a night light, so as not to wake her. In the darkness, I could see her form in bed. Then, to my horror, out of the corner of my eye, I also saw the form of someone else sitting, not moving, in a chair in the room! My heart pounding, I turned on the overhead light. What I found was a 6-foot tall, stuffed, pink rabbit Sherry had acquired. She had put the rabbit in the chair to get my attention. It certainly did. The most recent incident occurred last night. I’m a night owl, and Sherry was in bed fast asleep as I headed to our bedroom after midnight. As I passed by it, I glanced into one of our darkened spare bedrooms and stopped dead in my tracks. I could make out the form of someone lying on his back in bed! Again, my adrenaline flowed. 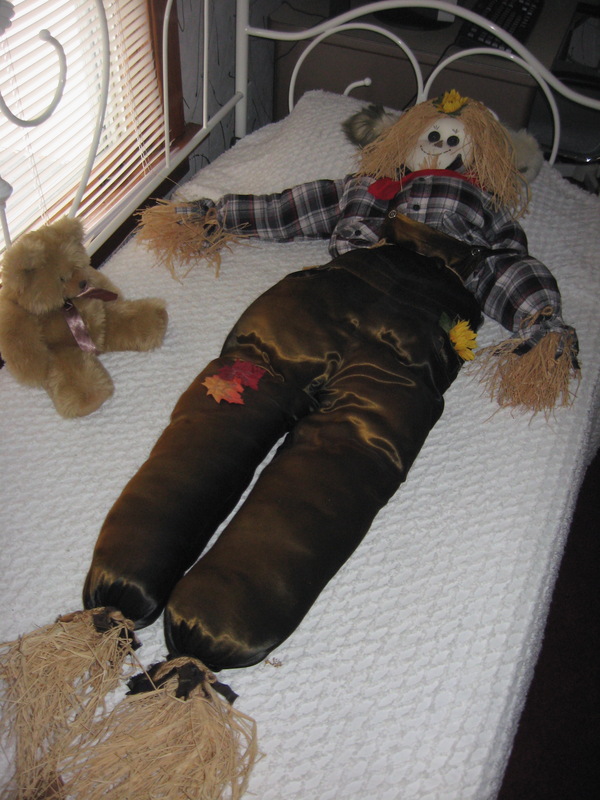 I flipped on the bedroom light only to find a smiling, 5-foot scarecrow all stretched out. He’d been part of our Halloween decorations and was waiting to be carried to the attic for storage. He could have been placed in a box or folded up and placed on the bed in a heap. But that obviously would not have won the desired result — to scare the life out of Phil. I really don’t know why I go the doctor for annual physicals. I know I have a strong heart. My wife helps me prove it regularly. Copyright 2011 by Phil Roberts, Creative Enterprises. Submitted to The North Scott Press as an “Everyday People” column.